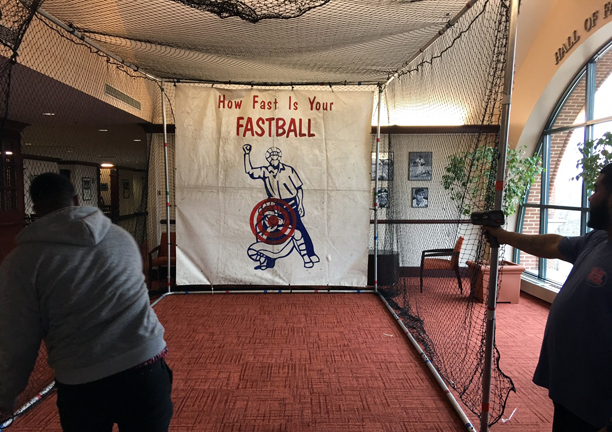 Rent Hire Baseball Speed Pitch Challenge - how fast can you throw a baseball? Step up to our inflatable cage and find out! Call Talk of the Town for your next event in the Suburban Maryland, Washington DC and Northern Virginia metro area 301-738-9500. Baseball Speed Pitch Cage - Pipe Cage - Bring the heat! How fast can you throw a baseball? Find out with our portable speed pitch cage. Fun for all ages, this is the perfect addition to any Spring Carnival, Summer Picnic, or Fall Festival. Includes: Cage, radar gun, baseballs, and 1 attendant. Great for ages 6 & up. Having a Baseball or Sports Theme Party? Take a look at these other party rentals: PC Baseball, World Sports Games, All in 1 Sports Arena, Bean Bag Baseball Toss Carnival Game, and of course our Poporn Machine, Cotton Candy Machine, Warm Pretzels, and Hot Dog Warmers.